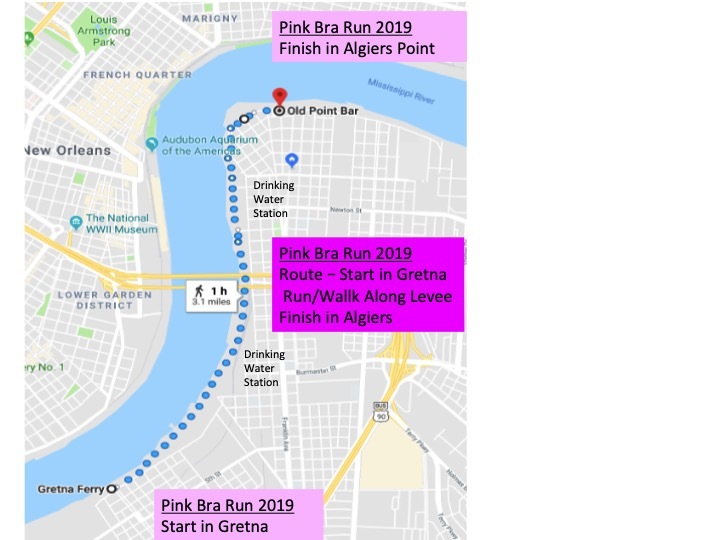 The Pink Bra Run is more than a 5K race... it’s a Saturday morning festival in beautiful, historic Algiers Point! What is a Pink Bra Run you might ask? Picture in your mind 500 participants who show up in decorated bras to run/walk a 5K along the Mississippi River levee with the beautiful New Orleans skyline in the background. If you are familiar with New Orleanians and their costumes, then this run is sure to be a sight and 2019 will be even better! Come on out and enjoy—even the dogs wore bras! All proceeds benefit Tulane Cancer Center's breast cancer research efforts. 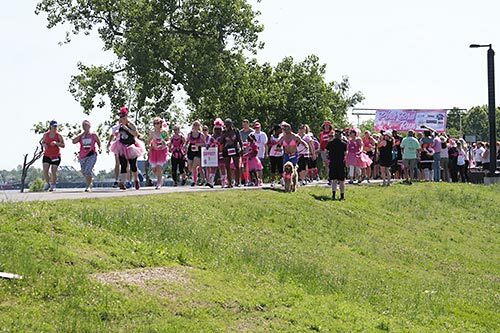 Can you imagine 200 participants in pink bras running along the Mississippi River levee? It is a fantastic sight! Come on out and be part of the newest 5K craze that is the Pink Bra Run! The "Best Decorated Bra" contest has been expanded to the top three male and top three female contestants. We'll have plenty of food and beer - Join us on May 12, 2018 for a great time! Starting in Historic Gretna near the Mississippi River levee across from the Rivershack. 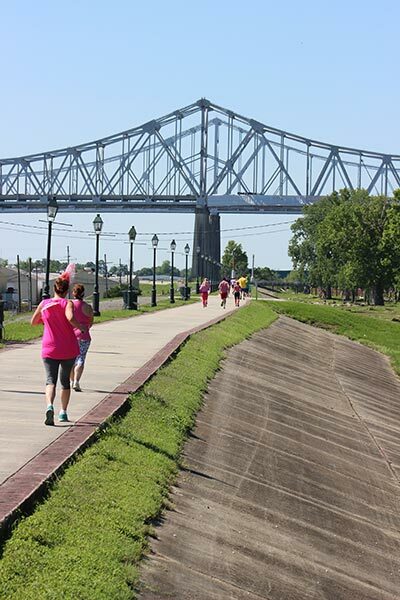 The Pink Bra Run is a 5K route that will offer some of the most beautiful scenes of the New Orleans skyline and the Crescent City Connection. Race Start time is 8:00am. Registration is as early as 7:00am. Show up in running gear or show up in costume – remember, this is a Pink Bra Run…so go ahead and bedazzle that bra and let’s go for a memorable stroll. There will also be a contest for the best decorated bra. Regular fee from March 3 to May 10th at noon is $30. Tickets available the day of the race, race day fee is $35. Traditional red beans & rice, jambalaya, pink beer and refreshments will be served to all race participants. Awards will be presented and the best decorated bra contest will be held...this is all followed by music, and dancing in the street and entertainment. Street party is sponsored by Alla Carnival Crew. Remember the Honor Wall. Purchase ribbons in order to write a message in memory of a loved one, friend, or co-worker. Donations are $5. This wall will be a living memorial; it will accompany each of Krewe de Pink's eventsand will continue to grow. After each event, a photo will be taken of the wall and placed on krewedepink.org. It is a virtual reminder to celebrate those who have survived, encourage those who are battling, and remember those we have lost.